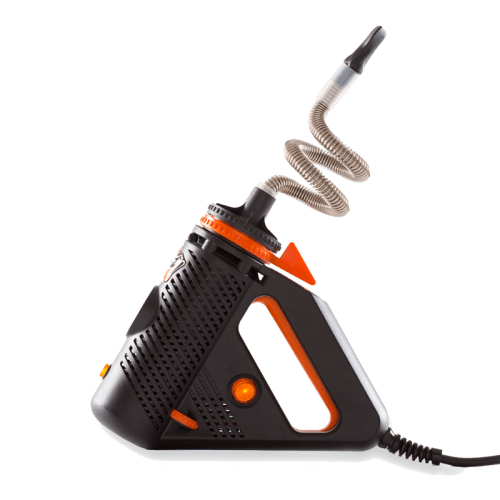 Storz & Bickel Plenty Vaporizer • Evertree • Ireland's Vaping Experts! Just purchased a Plenty and it is great!! Wow! The price was really great also! It was also delivered very quickly and was just as described. Got at the sale price – already have original PAX and wanted an upgrade / option. This blows away the PAX, imho. Easy to use, good flavor, easy to draw from (much better than the PAX). Only downside is it doesn’t stand on its own but there is an easy way to make it stand, so not a big problem. Really good stuff. Best to use in a party. But don’t carry it in the airplane. The Plenty gets it all done in a Big way! If you vape than there is no need for me to elaborate. I gave it 4 in value because I need to see how long it last. I’d been using portable vapes, and I decided to splurge on the Plenty. It uses less material and is much easier to clean because it uses convection rather than conduction. For that same reason, the vapor doesn’t have the burnt quality that my other vapes give. The cooling coil works great, so that the mouthpiece isn’t too hot on my lips, which I’d experienced with the others, even on their lower settings. It looks like something out of an old sci-fi movie. My only suggestion would be a longer cord. It’s everything it says it is, the most powerful vape I have ever used ! Easy to use, excellent [heating of your dry material], buy it, it is well worth the money. I wanted a handheld whip style vaporizer to use at my house and the Plenty turned out to be the perfect choice for my needs. First off, it is very well made and extremely easy to use. I’ve never used a Volcano but I can see why it has the reputation it does. Storz & Bickel made a great product here. I love the metal coil that cools the vapor while your drawing from it. I wish the gauge was digital and the auto off feature is a little tricky but other than those small gripes this vaporizer is simple to use and intuitive. At €350 it is a great piece. It produces large amounts of tasty vapor and doesn’t use a ton of material to do it. I’d recommend this to anyone looking at vaporizers, especially if they don t want a tabletop unit. I couldn’t be happier with my Plenty. Vape World did a great job shipping my order quickly, getting it to me in a timely fashion and answering any questions I had very quickly and thoroughly. Had this for a week now. we love it. works as promised, cool vapor with nice aroma. Have used the volcano and several portable vapes and really enjoy the Mighty. would buy again without hesitation. send you an estimate for the repair and will do the repair as soon as you have agreed to accept their estimate. You can use the Plenty for dry material as well as concentrates and liquids when you use the liquid pad, however you may be looking for something smaller like a vape pen that only vaporizes liquids. How long of a cord does it have? would it be fine for a car ride if i get one of those outlet adapters for the car? The Plenty's cord is pretty long, it's about 6 feet! Do you have to plug it in to use it? Yep! This is a desktop unit which means it has a cord. It does not have batteries and is not portable. Does this unit do concentrates? You can use concentrates when using the included liquid pads! What powers the unit plenty? batteries? a/c adapter? The Plenty is a desktop unit so it is plugged in the wall via AC adapter. I am trying to find a better way to enjoy my blends and i wonder if this is a good solid replacement to use at home. would this vaporizer be as good of a replacement as the volcano? If you aren't interested in a balloon style vaporizer such as the Volcano, the Plenty is a fantastic alternative for a desktop unit! Is there a display to see temperture? Yes, there is an adjustable temperature dial on the Plenty. Is it rechargeable. can liquid be used that would require higher temperature what is the temperature range and battery life or charge length. is there a video on and on could not find information. Plenty vaporizer is a desktop / plug-in vaporizer and is not battery powered. The included liquid pad will allow you to vaporize liquids with Plenty. Temperature required will vary depending on the liquid used. Temperature range is 266°F – 396°F (130°C – 202°C). All vaporizers will give off a scent. Can the volcano bags be used with this product? The Plenty is a direct draw only vaporizer and does not use bags / balloons.